The Senate unanimously approved a bill late Tuesday to reduce instances when victims of domestic violence are arrested alongside their attackers. The chamber also unanimously adopted a second measure that mandates a broad array of changes to the treatment of incarcerated women, particularly those who are pregnant. Both bills now head to the House of Representatives. 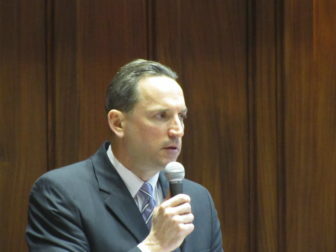 The domestic violence measure would implement a broad strategy to reverse a longstanding philosophy of “dual arrests” effectively imposed on police departments by existing law, said Sen. Paul Doyle of Wethersfield, Senate Democratic chair of the Judiciary Committee. In effect, police officers currently are encouraged in many instances to arrest both parties in a domestic violence incident. The bill, which was developed with bipartisan support, would direct officers to try to establish if there was a “dominant aggressor” in an incident, and if so, arrest only that person. “The ultimate goal is to not further victimize the victim of a domestic violence situation,” Doyle said. Connecticut has one of the highest dual-arrest rates in the nation. 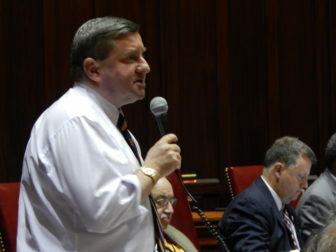 “Our statistics far exceed the national average,” said Sen. John A. Kissel of Enfield, the Senate GOP chair of the Judiciary Committee, who added too often victims of violence are further traumatized by being arrested. “This will create far less victimization,” he said. The measure regarding incarcerated women requires that the state employ at least one health care provider with specialized training related to pregnancy and childbirth at the York Correctional Institution in East Lyme, the state prison for women. A health care provider assess each inmate for pregnancy upon admission to the prison. Pregnant inmates receive counseling, medical care, a specialized diet, appropriate clothing and sanitary materials, and access to treatment for postpartum depression. Inmates with high-risk pregnancies be transferred to a medical infirmary or hospital. Counseling be provided to pregnant inmates before their release. The use of restraints be limited regarding pregnant inmates, including during transportation, labor and delivery, and during the postpartum period. It also requires written documentation when certain restraints are used. Visitation policies for all inmates with children under age 18. That all women receive feminine hygiene products free of cost, upon request. That the Department of Correction develop and implement a policy regarding the safety of transgender inmates by Oct. 1, 2018. That the department, the Board or Pardons and Paroles, and the Judicial Branch’s Court Support Services Division use a gender-responsive approach in their risk assessment analyses of inmates.